Both Jodhpur and Udaipur are a delight to those who are keen on understanding the glorious history of various kingdoms that ruled the state, and how the quintessential art forms thrived and stood the test of time, to enthral art lovers till date. There are remnants scattered all over the place and even their quaint, colourful lanes speak volumes of about their rich culture and intrinsic traditions. The cuisine is a must try, while the subtle variations in geographical conditions add to the diversity the state boasts of. There are multiple avenues to set the explorer in you free as well as get your adrenaline rushing with adventure activities. The cities are apart by an approximate four and half hours journey by road. Jodhpur, situated in the Thar Desert, was founded by Rao Jodha in 1459. It is known by several names – such as Sun City, for Jodhpur is apparently where the sun is seen rising first, and the Blue City, for the stretch of houses painted in shades of blue. The latter is a striking feature of the city. It is said that back in the day, this colour was used to identify those houses owned by the upper cast Brahmins. Like any other city in Rajasthan, Jodhpur too boasts of many forts and palaces – only that, it has more to offer, which you might not find in the other cities. The Mehrangarh Fort, build out of red sandstone, is one of the major attractions in the city and one of the largest forts in India. It is a sharp contrast to the sea of blue houses that it overlooks. The fort, with high walls for boundaries is situated 410 feet above the city and has many interesting stuff to offer, operated inside the fort – like a full-fledged museum equipped with regal artifacts from the bygone era, a gallery of paintings and even a restaurant to catch the breathtaking view over a meal. You’ll still find marks of cannon balls, and hand imprints of the women who committed sati centuries ago, on its walls. The Mehrangarh Fort is enveloped by intriguing myths and mysteries and folklores, which you can best listen from the local people. The fort is even said to be cursed and haunted. That is not just it. You can take your trip’s adventure quotient a notch higher by zip-lining with the Flying Fox Jodhpur. The Rao Jodha Desert Rock Park is another must-visit in Jodhpur. It was once a waste land which has now been converted into a desert rock park where you can go exploring and trekking. The Jaswant Thada, a cenotaph built by Maharaja Sardar Singh in memory of his father is a mesmerising architectural marvel for the white marbles used to build the cenotaph emits a warm glow as the sunlight hits it. Venture into the bustle of Jodhpur city by dropping in at the clock tower. The markets situated around the clock tower will ensure you a good shopping time and give you the feel of the city’s bustle. If you have time, take stroll along the blue lanes of the city and watch the life of the city that makes it stand out among the other cities. 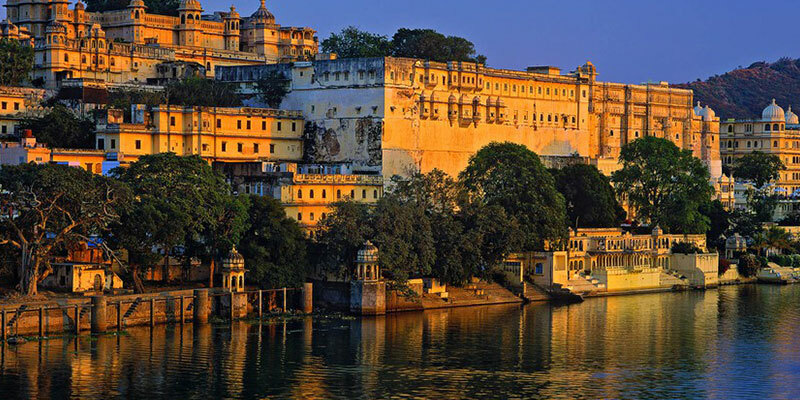 Udaipur, also known as the ‘City of Lakes’, has diverse experiences to offer those who visit the city. As the name suggests, the city is replete with manmade lakes, on the banks of which is located magnificent palaces. Udaipur, founded by Maharana Udai Singh II in 1553, is also known as the ‘Venice of the East’ and also has its share of wildlife sanctuaries. There are festivals happening during most part of the year, attracting tourists from all over the globe. These festivals are your best opportunities to catch Rajasthan’s very famous folk art live and at its best. The most popular and most visited destination in Udaipur is the fabulous Udaipur City Palace, situated in the banks of Lake Pichola. Four major and other minor palaces constitute this one grand palace. The balconies, cupolas and towers are striking features of the palace, which has remnants of the royalty stored inside for display. Boating services are available at Lake Pichola. Lake Palace is another posh palace located near the lake that has now been converted into a luxury hotel, and has made its appearances in several movies. Bagore Ki Haveli is where you must head to next, in order to understand more about Mewar’s culture. The place displays antique collection belonging to the Rajputs, like jewelry boxes, copper vessels, etc. Folk music and dance shows are regularly organised here. Visit the grounds of Garden Hotel to marvel at an array of their vintage car collection, most of them used by the maharajas. Shilpgram, is a traditional centre for arts and handicraft, in the city, where you can buy souvenirs to take back home. Evenings are apparently best spent at the Monsoon Palace. On the 5th day, you will be travelling back home. Our agent will drop you to the airport or railway station. With memories umpteen, you head back home.